So you’ve been paddling on mainly flat water since you got mitts on your spanking new Fatstick stand up paddle board. Now it’s time to step things up and push the feeling on. But where to go and what to do? If you really want to advance your skills, and get some stoke and excitement at the same time, then waves are an easy choice. 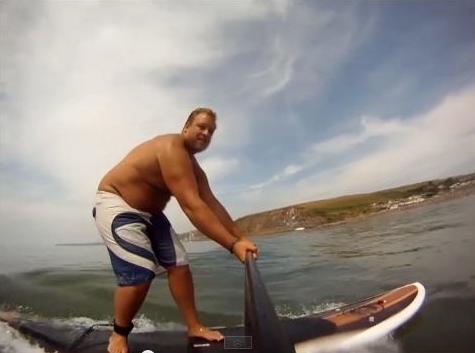 Surfing your SUP can be some of the most fun you can have. Of course stand up is super versatile, and we don’t need swell to keep interested, but chances are paddle surfing will give your sessions a whole new dimension. 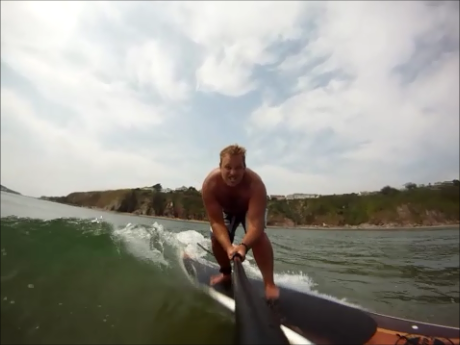 Surf can even lead on to other areas of SUP – such as downwind and even river SUP. Scanning social media streams you’d be forgiven for thinking that to paddle surf you need to be sub 80kg and riding uber small surf SUPS – but not so. Let’s get one thing straight: you can ride your standard size board in waves. OK, you might not be gouging sick turns on your all round 11ft but catch surf and glide you will. In time, once you start to develop more of an understanding about this new environment and increase your skills, you can drop down to a more performance orientated surf SUP. When you first start paddle surfing you may end up completely in awe of this new environment. It’s very easy to rely heavily on the momentum of your big board and forget the paddle. Yet if you work on keeping your paddle rhythm going your wave riding will be so much more dynamic and rewarding – and you’ll get longer rides and more waves. The best advice is to watch better surfers, both in the flesh and online, and work out what they’re doing with their paddle. Learn from those better than you and you’ll soon get the hang of it. If you’ve decided it’s time to kick it in waves then pick your days and choose your spots carefully. Nobody expects you to rock up on the biggest pulse of the year and start ripping. Choose smaller swells and less crowded locations to practice. If your usual peak is mobbed have a look further down the beach for a quieter take off or wait for the crowd to thin. Early mornings and late evenings can deliver easier going sessions. Here at Fatstick we’re extremely aware that stand ups aren’t always welcome in the line up. We also promote good surf etiquette and respect of other water users. If you’re heading into the waves for the first time then research surf etiquette thoroughly BEFORE venturing out. If you’re unsure about things, such as pecking orders (who get priority), then don’t be afraid to ask and get advice – a smile and conversation goes a long way. However, if someone tries to vibe you don’t rise to it, just smile back and make sure you remain respectful. Accidents can sometimes happen though – it’s inevitable. For the sake of keeping the peace always apologise (sometimes even if it’s not your fault). Before hitting the surf check your equipment. Make sure your leash and leash attachments are in good working order. Ensure your fins are secure and give your paddle a once over for hairline cracks. You don’t want any nasty surprises during your sesh so best be as prepared as you can and ensure your gear is fully serviced. If you’re thinking of giving waves a shot this winter then go for it. Research as much as you can about your spot, speak to long time riders, take things small steps at a time and above all have fun! This entry was posted in paddle surfing, stand up paddle surfing and tagged paddle surfing, stand up paddle surfing, SUP, surf, waves. Bookmark the permalink.